Hey guys, Ola here from @therookiehooker. I’m so excited to be sharing this bag pattern with you all in collaboration with Hobium Yarns. 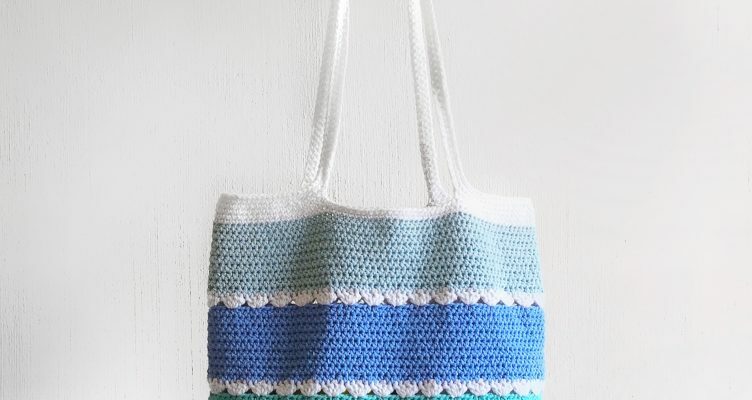 This bag was inspired by tide pools (Hence the name), shorelines and waves…. Basically, all things beach related. 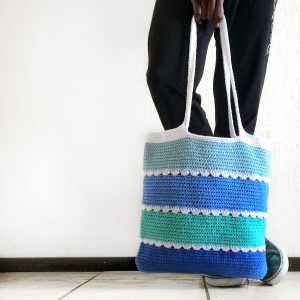 This bag is really easy to make, super strong, and large enough for all your beach essentials, groceries… whatever you need it for. I really hope you guys like it and if you do decide to make this, please tag me in your images on Instagram and use the hashtag #tidepooltote so I can see all your wonderful creations. So now let’s get started with the pattern. This bag is worked holding 2 strands of yarn at the same time so you’re either going to want to pull each skein from both ends, or wind up approximately half of each skein into a bobbin and just hold both halves together. Round 1: 3 hdc in the second chain from hook and 1 hdc in each chain across until you reach the last chain. 6 hdc in the last chain. Do not turn. Working along the other side of the chains, place 1 hdc in the next 44 chains. 3 more hdc in the first chain. Sl st to the first hdc to join (100 hdc). Round 2: Chain 1. 2 hdc in the same stich as last sl st. 2 hdc in each of the next 2 st. 1 hdc in each of the next 44 st. 2 hdc in each of the next 6 st. 1 hdc in the next 44 st. 2 hdc in the last 3 st. Sl st to the first hdc to join (112 hdc). Round 3: Ch 1. 1 hdc in same stich as last sl st. 2 hdc in next st. *1 hdc in next stich. 2 hdc in next st.* Repeat from * to * once. 1 hdc in each of the next 44 st. Repeat from * to * 6 more times. 1 hdc in the next 44 st. Repeat from * to * 3 times. Sl st to the first hdc to join (124 hdc). Round 4: Chain 1. Working in the back loops only, 1 hdc I same st as last sl st and in each st around (124). Attach Color B to the top of any hdc. Round 13: Chain 1 (Does not count as a stitch). 2 dc, ch1, 2dc in the first stich. Sk 3 st. *2 dc, ch 1, 2 dc I the next st. Sk the next 3 st*. Repeat from * to * around. Sl st to the first dc to join (124 dc). Fasten off. Round 14: Chain 1 (Does not count as a stitch). 1 hdc in each dc around, making sure to skip over the ch 1 spaces. Sl st to the first hdc to join (124 hdc). Round 24: Chain 1 (Does not count as a stitch). 1 hdc in each dc around, making sure to skip over the ch 1 spaces. Sl st to the first hdc to join (124 hdc). Round 33: Chain 1 (Does not count as a stitch). 1 hdc in each dc around, making sure to skip over the ch 1 spaces. Sl st to the first hdc to join (124 hdc). Lay bag flat, and attach color B to the top a hdc from round 41 on the SIDE of the bag. Round 42: Chain 1. 1 sc in the same st as last sl st. 1 sc in each st around. Sl st to first sc to join (124 sc). Round 43: Chain 1. 1 sc in the same st as last sl st. 1 sc in each of the next 20 st. *Ch 100. Sk the next 22 st.* 1 sc in each of the next 40 sc. Repeat from * to *. 1 sc in last 19 sc. Sl st to first sc to join (80 sc, 200 ch). Round 44: Chain 1. 1 sc in the same st as last sl st. 1 sc in next 20 sc. 1 sc in each of 100 chains. 1 sc in the next 40 sc. 1 sc in each of the 100 chains. 1 sc in last 19 sc. Sl st to first sc to join (280 sc). Round 45: Chain 1. 1 sc in same st as last sl st and in each sc around. Sl st to first sc to join (280 sc). Round 46: Sl st in each st around. Sl st to first sl st to join. And there you have it! The tide pool tote is all done! Don’t forget to tag me in your pictures on Instagram and use the hashtag #tidepooltote so I can see all your creations.